When doing research inside Detroit’s downtown juvenile detention facility, Luke Bergmann befriended Dude Freeman and Rodney Phelps—both petty drug dealers facing profoundly uncertain futures, living difficult lives in which chaos is always around the corner. Bergmann would end up living three years among the abandoned houses and desolate vacant lots of one of Detroit’s most notorious neighborhoods. In telling their stories and those of their families, Bergmann brilliantly explores the complex contradictions of Detroit’s status as a “chocolate city,” proudly and uniquely claimed by its predominantly black residents, where African Americans firmly hold municipal power but also suffer the legacy of lost manufacturing jobs and white flight. 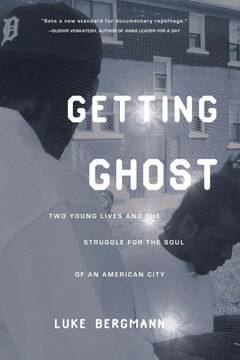 For young men like Dude and Rodney who strive to find ways toward “legal” jobs and straight lives, “getting ghost” is a rich metaphor—for leaving a scene, for quitting the trade, and for their own mortality. A tour de force of original analysis and powerful storytelling reminiscent of Adrian Nicole LeBlanc’s bestselling Random Family and Sudhir Venkatesh’s Off the Books, Getting Ghost paints an unforgettable portrait of two young men and of the troubled city they call home.